One of the things I do six months after people’s sessions is to mail out a questionnaire. It is a detailed four page document. In this questionnaire I ask detailed questions – part of the questions cover the level of relaxation that the person achieved during their sessions. The statistics consistently reveal a very high relaxation level. With 10 being the highest and deepest, the majority replied with an 8 or more out of 10. This CD uses similar processes to the personal one on one sessions. The CD takes the relaxation portion of the therapy sessions and adds much more detail to cover all possible questions and threads that your conscious mind could possibly need in order to let go and allow your body to relax. Unlike many other relaxation CDs available, this CD was created from live actual practice of people who did truly relax. The CD does not contain nice music. Nor does it sound like most others – where someone who does not do this for a living reads out a nice script hoping that the nice words will relax the person. Sometimes this works, but there is much more to a true relaxation process than what a person says. Much more. In researching existing relaxation tapes before deciding to produce my own, I wanted to find out what the popular ones were like. Had they progressed since the last time I listened to one about fifteen years ago? If they had, if they had progressed to the way I used the process then it would have been silly to reinvent the wheel if there were already products out there that did what I did in my relaxation processes in sessions. I was amazed to find that some of the current latest CDs sold widely today, in my opinion, had not progressed AT ALL beyond the relaxation tapes of fifteen years ago. People had simply added different nice music in the background, a nicer cover and the rest was virtually identical. At that point I realised I had to produce this CD. It was time to move forward. I mentioned above briefly that this CD is a product of many years of research and practice work. The practice work I also mentioned above, having developed this method from over 600 live trials. And not just 600, but actually closer to 1,800 trials to be exact. As most people had the minimum three sessions each. On the research side – most of this was embedded in my training in the different modalities that combined, forms my work. In all this training and practice a number of key points stood out strongly, I won’t go into them here too much as I don’t want to bog you down with details (there will be an article on this in more detail sometime soon on my web site, and I will provide a link to it here). But it is enough to say here, (which I also mention to some extent on the CD under tracks two and three), that there are some fundamental principles to truly relaxing that can help a person feel comfortable to let go quickly, that cannot in most cases be produced by some background music and someone reading out some relaxing words. This CD is not just some relaxing words for you to follow. On the surface it can be viewed in this way. But there is much more at work than just some relaxing words. Behind the scenes, gleaned from years of research, development and very importantly my very own personal development, there is much much more happening. It seems invisible because it is SUBCONSCIOUS and BODY BASED. And the results speak for themselves. Asking clients afterwards who relaxed deeply, how they did it, the response is usually a blank stare. There are no words to describe it. I guess you have to try it for yourself. If you are getting an inkling as to what I am talking about, follow this hint. If your gut instinct ‘feels right’ as you read this, then that sense is usually correct. It’s your body, your subconscious body talking to you and not just your intellect trying to make a rational limiting decision. Hi George,I hesitate to write so soon after receiving my CD but I can’t contain myself. I received it about a week ago and have used it several times per day since.I have used hundreds of relaxation/meditation tapes over the past 30 years. I initially started doing those that taught progressive relaxation then progressed to many, many others, including guided imagery, sound frequencies, binaural beats, etc, etc. I have never relaxed the way I have in just a few days using this CD. It is nothing short of miraculous.My only question is, will the “letting go” and releasing be a progressive thing? I can surely sense it happening each time I listen but I suspect some long held tensions may take quite a while to release (dating back to birth). That this CD should be this effective makes absolutely no logical sense. It has none of the bells and whistles of other relaxation tapes and yet it is truly effective the first time and every time. If you need a testimonial from someone who has seen and heard it all when it comes to audio relaxation devices, please feel free to use this. I just wanted to thank you so much for sending me your relaxation CD. I find it amazing and it has worked for me every time I have used it. I have been off my work for stress and anxiety for the last eight months and the CD has helped so much as I found it very difficult to relax fully. I bought your CD a while back, and have been meaning to provide you with some feedback ever since….I think your CD is quite unique, in that it does not patronize the listener, or make any spiritual claims. In fact you seem to take great care to de-mystify the relaxation process which is very gratifying to those who have become wary of the formulaic nature of many relaxation/meditation tapes. I would suggest that your CD is ideal for people who are sceptical about using relaxation CD’s or tapes, those who may have been disappointed by previous experience and those who have an aversion to anything ‘new age’! But, most importantly – it works! There are no strict instructions or rules – one is simply guided gently into a natural state of wellbeing. I think that the way you use your voice is what makes the programme so effective. Just thinking about it, and writing this has chilled me out! By the end of the programme (if I make it that far!) I do feel extremely relaxed both physically and mentally. I have also tried it on stressed out friends who are now similarly hooked! I like to view your CD as one of the first in ‘intelligent relaxation’. I hope that makes sense. I just received your CD in the mail and I have already listened to it. It is absolutely wonderful. Your education has paid off. I will give you more specific feedback when I have had a chance to listen to it several times. I studied psychology for five years so it helps me to understand a bit of what you are talking about. However, I have clearly missed out on a very important aspect of psychology – its connection to the body. We discussed this connection in counselling psychotherapy, but I have never experienced body-mind therapy. I knew I was missing something. Thanks for being an expert in this extremely important aspect of human life. Just some feedback on the CD. I was really sceptical at first, as I have found talking a distraction on CDs built for a similar purpose. But your CD leaves me so relaxed, I’m near to comatose by the time it ends. It also makes a significant change to my sleep patterns (I listen last thing before bed) – sleep is less interrupted, longer and distinctly more refreshing. Only problem is, now I get a bit grumpy if circumstances dictate that I don’t have time to listen to it. Received your CD and tried for the first time yesterday – really enjoyed it and plan on doing it every or every other day from now on! I’m what you would call a “New Age” person in that I do yoga, meditation, burn oils and incense and try whatever I feel will help me achieve that elusive peace of mind each of us craves. 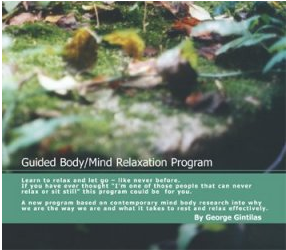 I have in my possession several meditation tapes that I have acquired over the years but none have had the long-term effectiveness on my mind, body and spirit as the effect that George’s relaxation CD has had. I have never experienced such a deep state of relaxation both in mind and body. Hearing George’s voice on the CD is almost like being inside the gentle surrounding of his therapy room and that effect creates a soothing and calming effect on one’s soul. Although the relaxation effect from the CD doesn’t banish your problems or issues, it does help you to gain a sense of clarity and perspective in helping you to deal with everyday stresses in a better frame of mind. I highly recommend the CD to anyone who has yet to purchase a copy. Your relaxation tape that I purchased some time ago now, has been a great help to me. So much so that I stopped using it~~~~until just recently when I stopped and took a look at myself and I realised that there was that build up again of unanswered feelings and confusion. Things had seemed so much smoother and clearer and simpler when I was experiencing the relaxation through listening to your very soothing voice and letting your words just float by or that’s the way it seemed. So I have started sitting down and listening again. And now I can’t wait to hear it again.